Guess who made Parineeti’s Day? Ever thought you’d wish for something and you have it at the drop of a hat? 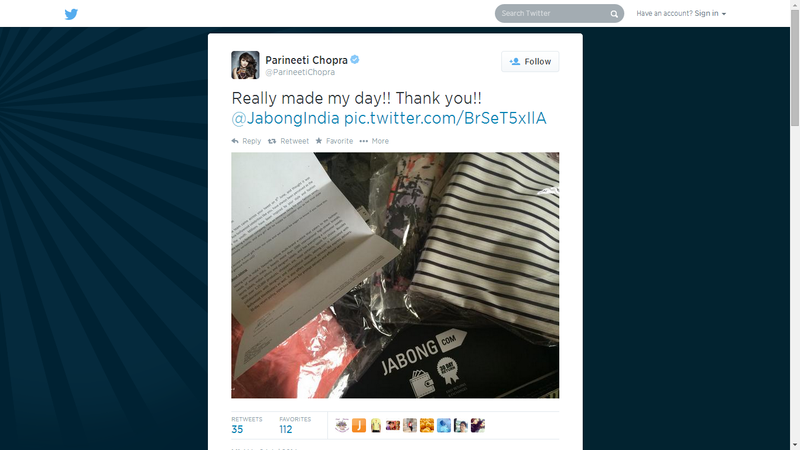 Jabong.com, recently extended their warmth and love to Bollywood actress Parineeti Chopra, by delivering smile at her doorstep. Jabong.com, India’s leading fashion destination that caters to the fashion needs of modern India turned as a genie for the peppy and spunky Bollywood’s actress. Stemming from a twitter post by Parineeti where she expressed her love for crop tops, Jabong made a selection from a plethora of fashionable apparel available on their website and delivered some trendy crop tops to Parineeti. How a simple imagination worked a treat for Parineeti! The crop tops were sent across with a personal note by Mr. Praveen Sinha, Founder and MD, Jabong.com. « Caring for your manes this monsoon! !